I have lost count of the number of field trips Ben’s first grade class has taken this spring, and we’re not done yet, and I seem to be driving them all. I’m not complaining; I’m not a committee mom — you won’t find me organizing this fund-raising gala or that anniversary celebration– I like to do the things that involve the kids most directly. I volunteer in the lunch room (more on that in a later post), I help out with messy art projects, and I drive field trips. And when I do, I bring muffins, because it seems no matter how short the drive might be (a recent trip to the symphony clocked in at about 7 minutes) it seems that as soon as the car doors are closed and the buckles are buckled, somebody’s hungry. A good muffin can satisfy hunger pangs and raise morale on a longer drive. Plus, although I have no particular guilt about offering my kids sweeter baked treats (I’m not as organized about it as Lisa, but I, too, let them eat cake), I haven’t found anyone yet who objects to a muffin. These are what I brought along on our farm field trip the other day, and they gave the car a nice banana scent, too. 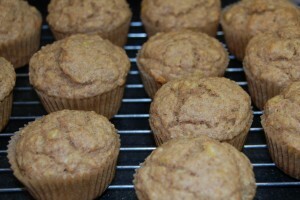 Preheat the oven to 375 and line a 12-cup muffin tin with muffin papers, or lightly grease the cups. Combine the soy milk and vinegar and set aside for a minute or two to curdle. Meanwhile, mash the bananas in a large mixing bowl, then add the soy milk mixture along with the oil, sugar, and vanilla. Mix well. We loved them! Thank you for sharing. Matthew told me that he doesn’t like muffins because they are dry, but he loved these. This after he told me his great-grandmother was “long dead” — love that kid! Thank you again — a perfect lunch!